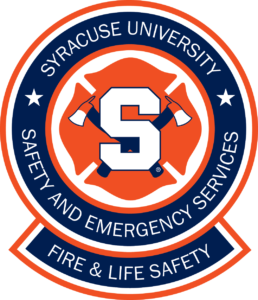 Fire and Life Safety Services (FLSS) responds to emergency incidents such as fire alarm activations across campus in partnership with the Syracuse Fire Department. FLSS is responsible for maintaining the University’s fire detection and suppression systems and related life safety equipment. FLSS manages and conducts inspections of residential, administrative, and academic facilities to comply with federal, state, and local applicable building and fire codes. FLSS staff are certified New York State Code Enforcement Officers. Fire and Life Safety Services is housed on the ground floor of Lyman Hall, room 029. FLSS produces an annual report, which is available within the Department of Public Safety’s greater Annual Security Report. The report is compiled annually and released each October.